It's been a rainy, grey day today, so I spent the day in my work room trying to get my Woodland Christmas patterns ready for publishing. I'm hoping to have them ready to go by the end of the month. Here are the photos of the first four patterns in the series. "Has Anyone Seen Rudolph? 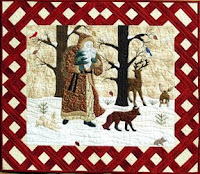 ", was quilted by Lisa Seinen, and the other 3 were beautifully quilted by Vikki Favreau of Kenora, Ontario. 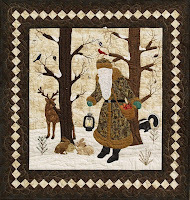 I especially like the quilting she did on the border of "The Gathering"(top right). After the release of the first four, I'm hoping to release a new pattern in the series every six months. I'm not sure yet how many will be in the series, but for now I have eight patterns drawn. The next thing on my "to do" list, is a web site. I've been told by many people that I need a web presence. A quilt shop out west contacted me last month and told me that it took them almost 3 years after seeing an "All About Bears" quilt at a show in Calgary, to locate me. Love the patterns, they are just amazing. Thankyou Cara. I'm glad you like them. The machine quilting done by Lisa and Vikki, really brought them to life. Those are so beautiful! I wish I had a machine that would do that beautiful embroidery work.